ACTmapi, which is the ACT Government’s interactive mapping service that provides the capacity to analyse ACT spatial data, has released 1955 aerial photos. It can be overlaid with cadastral information and a number of base maps. If you go to the link you can zoom in houses trees and parks as they were then. Under this topic we are collecting and presenting information on the history of the suburb of Deakin – its origins, its development, its residents. If you are a long-time resident or have family connections to Deakin, or if you have any contribution or comment to make on the history of Deakin, please contact the coordinator of this section: Richard Thwaites. There was a time when a light rail line ran from behind the Deakin shops to all the main centres of Canberra. At the end of World War I, construction of Canberra accelerated. A network of narrow-gauge railways was built to link the Yarralumla Brickworks to the main building sites and to the mainline railway terminus at Kingston. This map (on display at the Canberra Railway Museum at Kingston) shows that the main brickworks rail line followed a line that would become Adelaide Avenue to just past Hopetoun Circuit before heading more northward to the Brickworks. Another line branched south with a loop through Deakin, then back to Yarralumla and around Kintore Crescent to the brickworks. This Deakin light rail branch was to serve the excavation of valuable white clay in the area of the Deakin Anticline geological site that now lies behind the Deakin shops, between the Soccer Club and The Grange retirement village. Steam engines pulled the trains, bringing coal, the Deakin clay, and other materials to the Brickworks, then taking finished bricks, tiles and pipes back along Adelaide Avenue, round State Circle, and on to buildng sites at the Hotel Canberra, Old Parliament House, other Parkes buildings including the old Post Office, Kingston, and across the Molonglo valley to Civic. These construction railways were all pulled up as the initial construction phase of Canberra ended. The main railway was also extended from Kingston to Bunda Street/Garema Place in Civic, passing through Campbell and Reid, and planned to run up through Braddon as far as Haig Park. Proponents of light rail and public transport may wish many of these lines had somehow been preserved. Walter Burley Griffin won the international competition for an overall design of Australia’s national capital, and was Director of Planning and Construction for the federal capital until 1921, when he was (controversially) sacked. His detailed city and suburban plans had been developed as early as 1916, and remained mostly intact after his departure. 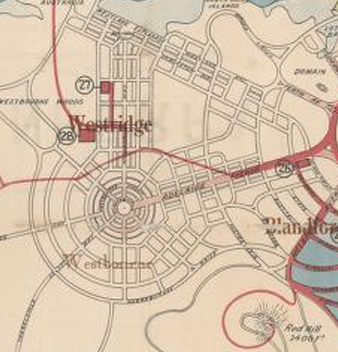 In 1927, a map was published commercially as part of a guide for visitors attending the opening of Parliament House (Old Parliament House), with the name “Westridge” applying to the area of Yarralumla and Deakin. 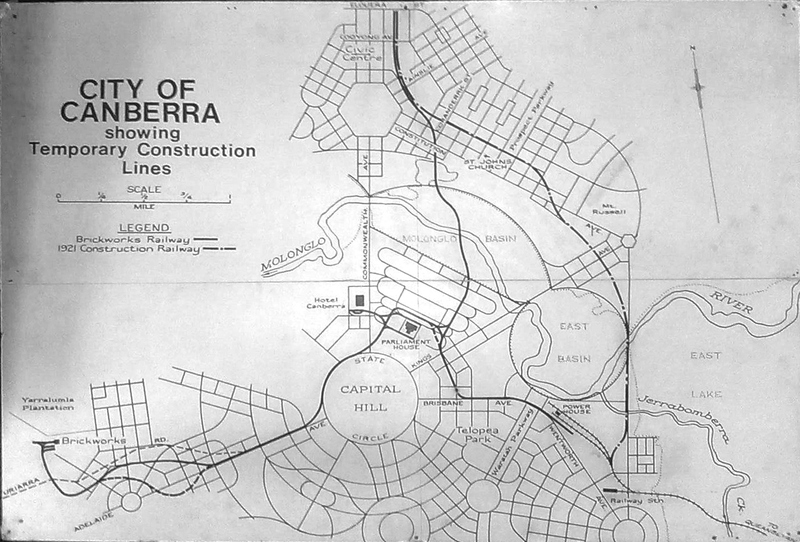 The whole Canberra map can be viewed online from the National Library’s great collection. The elements actually existing in 1927 are marked in red. In Deakin, only the Prime Minister’s Lodge, National Circuit and part of Adelaide Avenue were built by then. The old Uriarra Road, now renamed Cotter Road, wanders up through Yarralumla near the line of Weston Street and Hampton Circuit, to join Adelaide Avenue where it peters out about where Robe Street, Deakin faces Adelaide Avenue. Griffin planned that Adelaide Avenue would terminate in a great cartwheel of circular residential streets, covering a large portion of Deakin West, of Yarralumla’s southwest corner, and of the Curtin horse paddocks along Yarra Glen as far as the creek. The cartwheel’s hub is at at the current intersection of Kent/Novar Streets with Adelaide Avenue. Of this proposed residential suburb, only part of Kintore Crescent (Yarralumla) and McCartney Crescent (Deakin) remain where Griffin had drawn his concentric circles, though you could argue that Abbott St, Yarralumla and Gormanston Cres, Deakin also fit that outline. West of Kent St, no shadow remains. The basic street plan east of Hopetoun Circuit (then called Australasia Circuit) is close to the modern plan, but there are several differences. The Griffin plan had Stonehaven Cres cutting across Latrobe Park to join Gawler Crescent opposite Canberra Girls Grammar School. Later plans added Bedford Street as the northern boundary of Latrobe Park. Much later, the line of Hopetoun Circuit was extended to a new roundabout joining Melbourne Avenue, a re-aligned Mugga Way, and Red Hill drive, forming a southern boundary to Latrobe Park. This extension took the name of Stonehaven Crescent, as the original proposed line of Stonehaven Crescent was never built. It can be seen in the row of tall radiata pine trees that come down from the corner of Melbourne Avenue between the oval and the barbecue area of Latrobe Park. Griffin’s map shows high-density apartment blocks along both sides of Adelaide Avenue from National Circuit to the Westridge cartwheel. 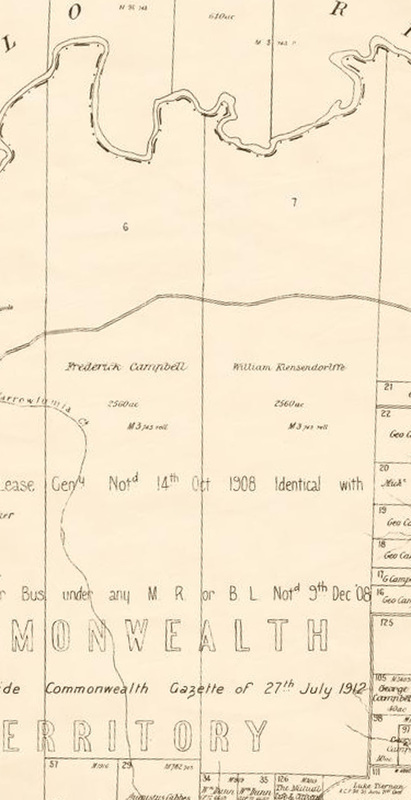 By contrast, in 1919 the Federal Capital Authority was advertising the large 3-acre blocks in Red Hill, bordering Flinders Way and Mugga Way, as “orchard blocks”, with a requirement that they become productive within five years. His notion that Canberra would be a compact, self-sufficient community was soon overtaken by the reality that it would be populated more by public servants and service professionals than by toiling horticulturalists, and his “orchard blocks” are now Canberra’s most expensive mansion blocks. The land on which Deakin is built first came under white occupation in 1829, being parts of two land grants which fronted on the Molongo River. Each was of 2560 acres, and extended south past Red Hill. The more easterly block was known as “Klensendorlffes”, though Robert Kelnsendorlffe only occupied it for a few years before going bankrupt. After this it passed through various hands and tenancies until finally coming under the ownership of the Campbell family of Duntroon. The eastern boundary of this block was a little west of the line of Commonwealth Avenue, skirting the western side of what became Capital Hill. The western boundary of Klensendorlffe’s was more or less on the line of Hopetoun Circuit. The block extended well south of Red Hill towards modern Hughes. The westerly block was granted to Robert Campbell and remained part of the Yarralumla estate through various changes of ownership until resumption by the Commonwealth in 1912. It included modern Weston Park, West Deakin and Yarra Glen down to current Woden. These two blocks were crossed east-west by the old road from Uriarra to Queanbeyan, which came from the current line of Cotter Road, south of Yarralumla homestead, and crossed modern Yarralumla suburb more or less along the line of Schlich Street and Perth Avenue, then around the north of Capital Hill not far from the location of Old Parliament House. Later maps show the Uriarra Road taking a more southern route from Yarralumla, to cross the corner of Deakin right behind the Lodge and around the south of Capital Hill before heading off towards Queanbeyan along the line of Franklin Street, Griffith. So bullock drays once creaked along where young hoons now rev their cars in Manuka on a Friday night. This early history has been written up in detail by Anne Gugler and Patricia Frei in their excellent and detailed histories of Yarralumla suburb. For a chronology see their Timeline of Stirling Park. All the early settlement and intensive farming seems to have taken place in the northern parts of these blocks, on more fertile land nearer the Molonglo and other watercourses. This history belongs to modern Yarralumla. The higher, drier land on which Deakin was built was, for all that early period, the back paddocks used for grazing, some timber-getting, and a bit of quarrying.